“How secure is your password?” In an era where one recent study revealed that a massive 19% of all business passwords are “easily compromised,” that’s absolutely a question you should be asking yourself on a regular basis. Another study recently revealed that about 35% of LinkedIn users – or roughly 63 million people worldwide – have unsafe passwords and are thus at increased risk for a cyber attack at some point in the future. So for most people, their current passwords really aren’t as strong as they probably think they are. However, all hope is not lost. If you really want to create a secure password and keep the contents of your digital life away from prying eyes, the good news is that it’s a lot more straightforward of a process than you probably think it is. You’ll just have to keep a few key things in mind. Your password will include at least one instance of capitalization, but many is preferred. It will include at least one number. It will also feature at least one special character. You will only use it for one account, NOT for multiple logins. 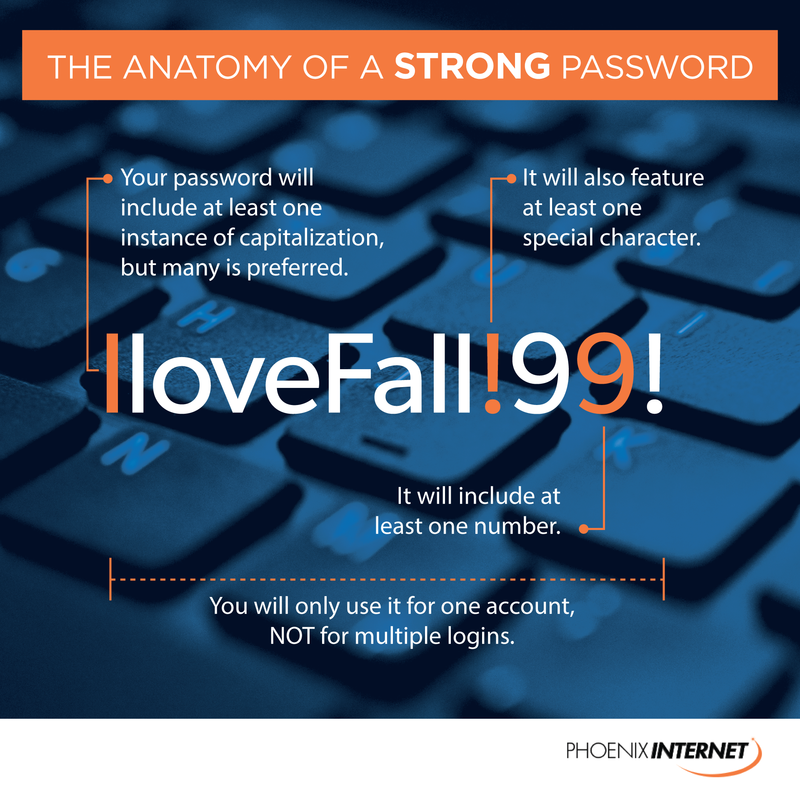 An example of a password that uses all of these rules would be something like “IloveFall!99!” (without quotation marks). The sentiment of “I Love Fall” is a good starting point, because it should be relatively easy for you to remember. The multiple instances of capital letters are perfect for creating a more secure password in environments where they’re case sensitive, and the numbers and the special character make it all far more difficult for someone to guess – even if they know that your password probably includes some type of common phrase that is meaningful to you. At this point, you may be worried that you’ve created a password that is so strong you’ll be unable to remember it – but these days, that’s not something you have to stress out about any longer. A wide range of different password manager applications are available for any platform you might be working with – from desktop operating systems like MacOS and Windows 10 to mobile environments like iOS and Android and more. Programs like Dashlane, 1Password and others will not only make the process of creating a secure password effortless – they’ll also remember those passwords in a way that allows them to be easily retrieved at all times, even as you move from one platform to another. Not only do these types of solutions integrate with virtually any web browser you might be using, but a lot of them are even free (if you’re only going to be using basic features). Oftentimes these programs will also automatically alert you if you’ve been using a particular password for too long, and will let you test your password to make sure it’s really as secure as you think it is. This proactive approach to safe passwords may seem like a bit of additional effort as opposed to coming up with a common phrase that is easy to remember, but it’s also effort that is more than worth it. When you consider the potential ramifications of allowing one of your accounts to become compromised, you’ll be glad you took these steps today to help avoid a potential disaster tomorrow. Strong passwords also need at least one number for the best results, but multiple are always preferred. Strong passwords also tend to have a mixture of both capital and lowercase letters, especially for those that are case sensitive. You can always use a password manager like 1Password to keep track of your account passwords and other user credentials in a cross-platform way. 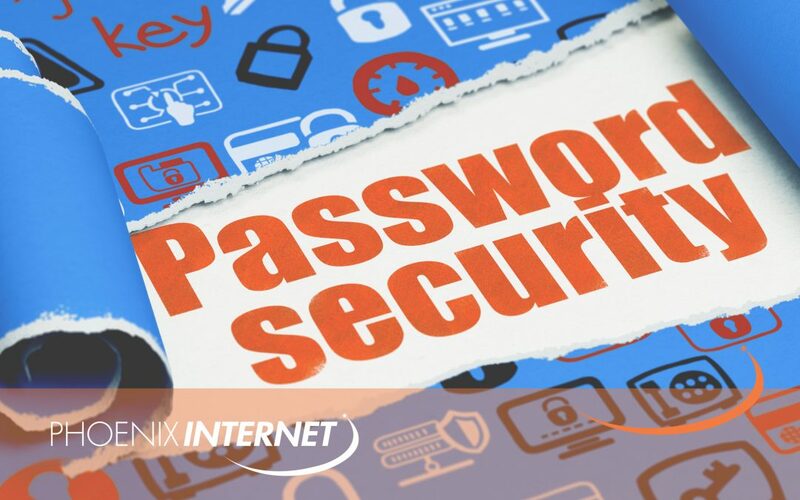 If you’d like to find out more information about the anatomy of a strong password, or if you’re looking for more information about how we can help bring about a bold new era of productivity for your business by way of our sophisticated business Internet services, please don’t delay – contact Phoenix Internet today.